The first work in the second half of the show will be a world premiere, A Quiet Constellation by composer and Southwestern University professor Jason Hoogerhyde. To end the program, the orchestra will perform Alexander Glazunov's Rhapsodie Orientale, Op. 29. Now in its third year, the Moontower Comedy and Oddity Festival is quickly becoming one of the largest comedy festivals in America. For this year's fest, around 100 comedians will come together from Austin and around the world to perform dozens of shows, including sketch, improv, and lots of standup comedey. 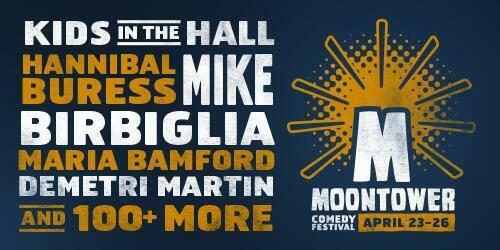 Headliners include The Kids in The Hall, Hannibal Buress, Mike Birbiglia, Maria Bamford and more. They'll perform at the Paramount Theatre, while several smaller venues host shows nearby.